The AmpFlow speed reducer is a heavy-duty, low-cost, gearhead that works with any of the three-inch diameter AmpFlow motors. This speed reducer uses a unique three-stage chain-and-sprocket mechanism that reduces cost while still maintaining high torque capacity. This unit provides speed reduction and torque multiplication, and it's an easy way to "bolt-in" the AmpFlow motors. These speed reducers are made with a three-piece aluminum case that has been precision CNC machined. A total of six sprockets, three roller chains, and five bearings comprise the mechanism. The long output shaft makes it easy to mount pulleys, sprockets, gears, or wheels in the required position. Care was taken to make this unit as compact as possible. The overall dimensions are 6 inches x 3 inches x 2 inches. 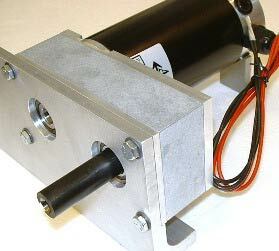 But the motor is recessed slightly into the reducer, so the net length added to the motor is only 1.78 inches. 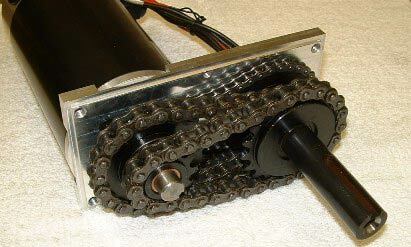 The speed reducer uses a unique arrangement of roller chains. This results in torque and efficiency comparable to gear-type reducers at just 1/2 or even 1/3 of the cost of high-torque, geared speed reducers. There is slightly more noise, but these units are ideal when silent operation is not required. The hardened output shaft is 3/4-inch diameter and 2.2 inches long. It has a 1/4-inch key and a 5/16-24 tapped hole. It is fixed to the sprocket with a hexagonal spline to strengthen the connection between the shaft and sprocket. A single stage of roller chain reduction is generally considered to be about 98% efficient. Add in some friction from the five bearings and we are at about 90% efficiency. This picture shows the speed reducer undergoing a torque capacity test. The motor is locked and unable to turn. Weight is loaded onto the end of the 40-inch bar until the speed reducer fails. The failure point is 3500 inch-pounds. This gives an almost 2-to-1 margin of safety when used with our most powerful motor, the A28-400. The failure point is the chain on the last stage of speed reduction. The gearbox suffered no other damage. The $10 chain was replaced and it's as good as new. The gearhead is tested for backlash by locking the motor in place. A load of 200 ounce-inches is applied in both clockwise and counter clockwise directions. The total deflection is +/- 1.2 degrees. This figure may increase somewhat with higher loads and chain wear, but replacement chains are available. Four long 1/4"-20 bolts go all the way through the width of the reducer. The four mounting bolts are supplied with the the unit. 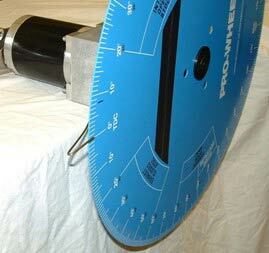 They are sufficient in length to mount the gear motor to a 3/8-inch thick panel. If the panel is thicker, longer bolts will be needed. Do not operate the speed reducer with bolts that are missing or too short - they are required for structural integrity.